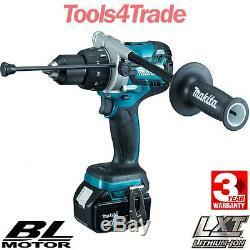 Makita DHP481Z 18v LXT Lithium-Ion Combi Hammer Drill With 1 x 5.0Ah Battery. Single sleeve keyless chuck allows for easy bit installation/removal by one hand. Twin LED job light with afterglow. Variable speed control by trigger. Best possible ergonomic handle for drill-driver applications. Chuck Capacity - 1.5 - 13mm. Blows per Minute (Hi) - 0 - 31,500ipm. Blows per Minute (Lo) - 0 - 8,250ipm. No Load Speed (Hi) 0 - 2100rpm. No Load Speed (Lo) 0 - 550rpm. Torque Settings - 21 + drill. Vibration K factor - 1.5 m/sec². Fastening Torque (Soft Joint) - 60Nm. Fastening Torque (Hard Joint) - 115Nm. Vibration: Impact drilling into concrete - 6.5 m/sec². Vibration: Drilling into metal - 2.5 m/sec². 1 x 5.0Ah Battery BL1850. Additional charges wil be imposed if, weight is more than1 kg. Postcodes Details are Given Below. HS 1-9, I 1-56, KA27-28, KW1-17, PA20-49, PA62-77, PA60-61, PA78, PH17-26, PH-30-44, PH49-50, ZE1-3, BT1-94, IM1-9, IM99, TR21-25, Isle Of Wight. If, you receive any Parcel from us that contains damaged goods, this should be notified to customer services who will arrange for collection and replacement, within the 24-48 hours period. The item "Makita DHP481Z 18v LXT Lithium-Ion Combi Hammer Drill With 1 x 5.0Ah Battery" is in sale since Tuesday, May 15, 2018. 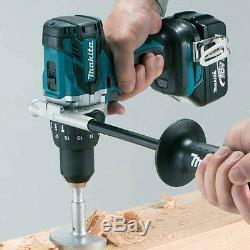 This item is in the category "Home, Furniture & DIY\DIY Tools & Workshop Equipment\Power Tools\Power Tool Sets". The seller is "tools4trade" and is located in London. This item can be shipped to United Kingdom.